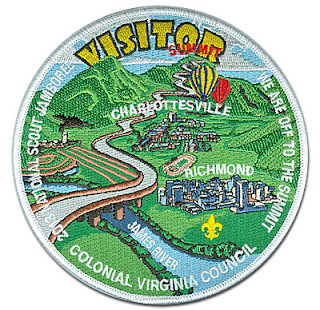 Earlier this summer Colonial Virginia Council issued a set of 5 Jamboree Shoulder patches surrounding a pentagon-shaped center patch. The 5 shoulder patches included two trader issues with a military theme, a patch for each of the Council's Jamboree troops, and a patch for Council members serving on staff at the 2013 National Scout Jamboree. The Council also issued a special round jacket patch for their contingent of visitors who shared a bus to and from the Jamboree site on July 20. The group of 85 was comprised of members from Colonial Virginia and Heart of Virginia Council. Thanks to Will Richards of Colonial Virginia Council for the picture of the patch and background information.